This installation piece about the aftermath of a Kosovo massacre used one large projected slide in a dark viewing space together with a 17-minute soundtrack. It was shown at the Hasselblad Center together with a newly curated version of Homes and Gardens: Documenting the invisible. 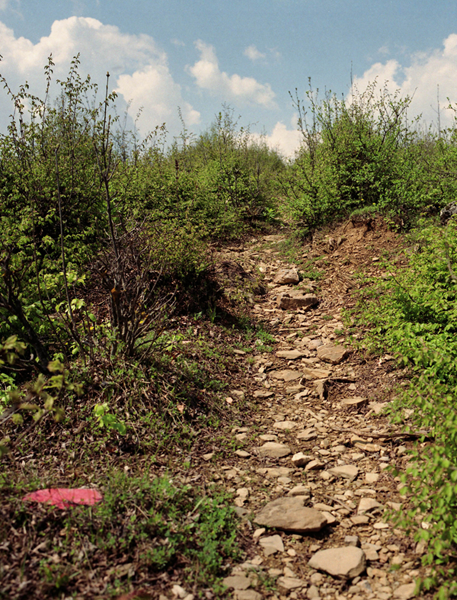 In April 2000 as part of my work documenting the aftermath of the war, I began to photograph the sites in Kosovo where massacres had occurred, exploring the after-effects of trauma on survivors among both Albanians (the vast majority) and Serbs (who had suffered ‘revenge attacks’ after the Albanians returned to Kosovo). Here I used images of empty landscapes where the massacres happened, together with the narratives of the survivors. I was drawn first to the site at Reçak where, on 15 January 1999, 45 unarmed Albanian civilians were killed by Serbian police forces and Yugoslav army forces (Human Rights Watch, 2001). This atrocity deeply shocked The Organisation for Security and Co-operation in Europe (OSCE) observers in Kosovo; it was a contributing factor to NATO’s subsequent intervention and bombing of Yugoslavia. Following the Kosovo war, coach tours took Kosovar Albanians around some of the most notorious massacre sites, where the worst atrocities were committed; bereaved relatives sometimes became ‘guides’, in the spirit of commemoration. [There are parallels here with the tours of World War I battlegrounds, etc.]. The Guide too, takes the audience on a tour. I met with one such guide, Shefqet A., one of a handful of men who survived the massacre at Reçak. I was wary of an interview ‘re-traumatising’ him but he was more than willing to take me up the hill and show me the site. As we climbed the hillside, the urgency with which he spoke - over one year later - about the events of that day was extraordinary. I felt that recording Shefqet A. rather than merely photographing him at the site gave him more agency. The following day I returned with interpreter Edita A., whom I knew well and had worked with many times. I decided to just let the tape run and record his harrowing testimony as we climbed the hill together. Because Shefqet had already shown me the site, the conversation became more between himself and Edita, as his new audience. He was our guide, and we were on a tour – macabre, but necessary in that as with the Holocaust survivor narrative, “the failure to bear witness may be even more unendurable than the act of recollection”. Still, I was uncomfortably conscious of my role as a kind of tourist, in the way that journalists often are - while Shefqet A. is fated to be on that hillside forever in his mind. Days later, he said that making the recording had been helpful. Although Edita A.’s English is by no means fluent, her rough translations at Recak give the piece immediacy and an emotional rawness that would be lost with a more polished translation. As we progressed up the hillside I realised that the experience was of course taking its toll on Edita, too, and from an unperturbed beginning, her translations became more tentative, the tension and emotion in her voice palpable. This is an uncomfortable piece of work, and makes harrowing listening. As the focus shifts from the event described, to the survivor, the work attempts to capture some of the torment of Shefqet A.’s recurring images and sounds – the memory that replays constantly inside his head, which he is, as yet, unable to escape. The piece thus focuses not only on the narration of the event, but also on the psychological after-effects: “Sometimes I stay awake all night, talking with the souls of my friends who were killed here. When I talk to them, it’s like they are all alive … I believe that until I am dead, I will not forget. This memory will never come out of my brain.” (Shefqet A., in Friend, 2001:52). The soundtrack is on a loop. My installation piece, The Guide, combined just one still image (projected as large as possible on the gallery wall in a darkened space so that the viewer can situate her/himself in the projected landscape) with a 17-minute soundtrack, effectively taking the audience on an audio tour with the massacre survivor, Shefqet A. (It is reproduced as text and image in No Place Like Home: Echoes from Kosovo). At the Hasselblad Center the slide was projected huge against the gallery wall, in a darkened space behind a large black curtain. Chairs were provided – a simulation of a cinematic experience. However although the presence of a slide projector may raise expectations of a number of slides, the one slide never moves. The image we see of course conveys nothing of Shefqet A.’s subjective experience of the massacre over a year earlier: that is left to his story, and our imagination (and ultimately is beyond communication). I chose the path with the red stone (deliberately out of focus at the edge of the image) and its presence is explained five minutes into the soundtrack. Otherwise, the image is of an ordinary path in a Mediterranean landscape – there’s an incongruity between place and event. The tension between the tranquillity of the still image of the summery landscape, and the horror of the soundtrack follows on from my 1996 work Homes and Gardens.